THE locals say that Mykonos is an island of contrasts. As I stroll around the beautiful island in the Aegean Sea, I tend to agree. I soon see just why it is famous for its beautiful clear blue water and beaches, whitewashed buildings, bright pink bourgainvillea, blue doors, stunning sunsets and warm climate. Mykonos is weaving its magic. again. Until the 1960’s the island was a well-guarded secret from the tourists of the world. However, once the rich and famous dropped the anchors of their yachts in the sapphire blue waters of Mykonos the tourists started to follow. Celebrities such as Jackie Kennedy, Grace Kelly, Marlon Brandon, Elizabeth Taylor and Richard Burton and Brigette Bardot were soon being spotted on the glamourous island. Christian Dior famously crowned the town’s tailor Josef Salachas 'le roi du pantalon' (the king of trousers), inspiring Givenchy to collaborate with him on a couture collection. Over the next decades tourists started to flock to the island, and the island soon became known as a party island and extremely welcoming to the LGBT community. Today the island continues to welcome the rich and famous to its shores. Recent visitors include Leonardo DiCaprio, Mariah Carey, Nicole Sherzinger, Gerard Butler, Usain Bolt and Kate Moss to name but a few. Mykonos’ party scene is legendary thanks to its numerous cocktail bars and nightclubs. But as I was told ‘the windy island’ of Mykonos is an island of contrasts and there is so much more than just the party scene on offer. One of the most picturesque areas of Mykonos town is ‘Little Venice’. The homes of the fishermen have been converted into bars and restaurants and their colourful balconies over the water are the perfect location to sit and enjoy a drink and the sunset. The island is also home to its famous 16th-century windmills on the edge of Mykonos town. Today only seven remain on the edge of Chora, the island’s capital. They have been restored and are worth a visit to see up close these important pieces of the island’s history. One of the most iconic images of Mykonos is the number of private family chapels located in the town and across the island. 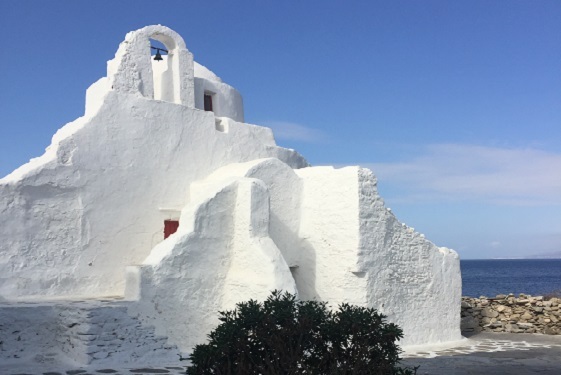 The whitewashed buildings have been named by the Ministry of Culture as protected historical monuments.The chapels were originally built as a tribute for the safe return for the island’s many sailors and fishermen. Today there are said to be close to 500 on the island and house the remains of family members and are also used for religious celebrations. One of the most famous and most photographed churches on the island is Church of Panagia Paraportiani. Located near the waterfront, the church is actually made up of five smaller churches and has been constructed with newer additions being added over the centuries. A hidden gem that TLTB discovered walking around the town was ‘The Gioras Wood Bakery’. Visiting this small bakery in the heart of the town is like stepping back in time. The bakery has been operating since 1420 and was once supplied with flour which had been milled by the famous windmills. Experts have deemed this bakery as ‘the Parthenon of all Greek Wood Bakeries’. Today the baker is George and his family has run the bakery for the past 200 years. All of the delicious sweet and savoury treats on sale are made using local ingredients and baked in the wood oven. The bakery acts as a recycling centre for wood that is no longer required by the islanders - TLTB saw an old wooden chair being prepped for the fire. For the boat trip we were about to take TLTB picked up a delicious cheese pie and some traditional sweet biscuits, sold to me by George the baker himself. The nearby island of Delos, UNESCO world heritage site, is a must-visit day trip when visiting Mykonos. The birthplace of Zeus and Leto’s twins, Goddess Artemis and God of Light Apollo really is a fascinating place to spend an afternoon. Delos is a sacred island known as the birthplace of light and Mykonos is named after Apollo's son Mykons. A 30 minute boat journey from the harbour is like taking a ‘time machine’ back thousands of years. The island is regarded as Greece’s most important mythological, historical and archaeological sites. The island and its museum features art, statues and mosaics from different periods and eras since 3rd millennium BC Wandering the quiet ruins and hearing only the wind blowing though the pillars, houses, theatre and temples, Delos seems like a world away from the bustle of busy Chora. 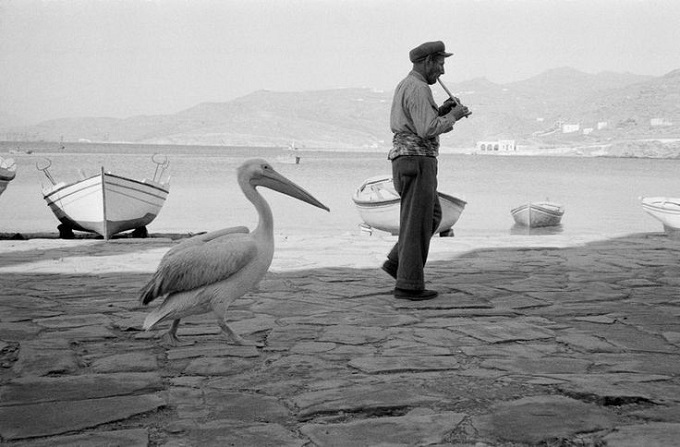 When he died such was the loss, that a replacement Pétros was found and still today his successor wanders around the island being photographed by tourists.When taking a walk around the Mykonos harbour, which was made famous in the movie Shirley Valentine, tourists might spot the island’s most famous resident – Pétros the Pelican. The official mascot of the island has become somewhat of a celebrity since he was found by a fisherman following a storm in 1954. The wounded bird was nursed back to health and he soon made the Greek island his new home. So famous was Pétros that he met Jackie Kennedy and she donated another Pelican, Irene to the island as a companion. My tour guide told me that the best advice she would offer to tourists on the island is to ‘Get Lost’. Rather than be offended by this instruction, it really is great advice for holidaymakers. Getting lost will allow tourists to discover little souvenir shops that are next door to the high end designer boutiques. The narrow streets lead towards intimate cafés and small squares which also feature champagne bars and centuries old chapels. There is something new to discover down each alleyway... Like I said, it’s an island of contrasts.